Olympian archer Eleanor Hudson is sent back in time to Medieval Nottingham. Even she can tell where this is going. There have been a lot of Robin Hood rewrites, there’s been a lot of female Robin Hood rewrites, and there’s even been a lot of time travel back to Medieval England, and yet this book was still a fun ride. 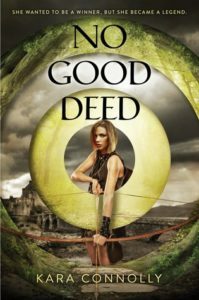 This book has clever twists on classic characters, a unique plot (this isn’t a verbatim tale of Robin Hood’s merry men), and a well-written personal journey for the protagonist with her own non-folkloric problems. And who doesn’t want to read about a talented female athlete embarrassing an evil sheriff with a English longbow?